Is Bill Mallonee the 65th Greatest Living Songwriter? I don't know. I've never heard his stuff. But this profile of Mallonee intrigues me. Howard LaFranchi has some informed speculations. Those with whom LaFranchi spoke speculate that, owing to our own financial crisis, the one precipitated by falling oil prices in Iran, and the upcoming Iranian presidential election in which incumbent Mahmoud Ahmadinejad is, by no means, a shoo-in, Obama will take deliberate approach to confronting and eliminating Iran's nuclear weapons program. An endorsement of the Israeli-Syrian talks, "thereby signaling to Iran that a new American approach is at work in the region – one that engages Tehran's assumed partners." This will put some pressure on Tehran, making the regime there look intransigent and out of touch in the face such US openness. Improving US relations with Russia. LaFranchi quotes Geoffrey Kemp, director of regional strategic programs at the Nixon Center in Washington as saying: "It's our mishandling of the Russia portfolio that has emboldened the Iranians." Of course, during the presidential campaign, Senator Hillary Clinton made much of Obama's willingness to talk with people like Ahmadinejad. In one of the early Democratic debates, the President-elect seemed to indicate a willingness to meet with such folks without preconditions or the carefully calibrated diplomacy necessary to make "summits" work. Obama later refined his position. Now, according to LaFranchi's report, the questions of Team Obama is not whether to talk with the Iranian regime, but how, when, and under what circumstances. Although this more calibrated approach is some distance from what Obama first discussed in 2007, it nonetheless will represent a departure from the approach of the current administration. Zimbabwean president Robert Mugabe and his military henchmen will do anything to maintain power in their country, even preside over the unnecessary deaths by starvation and disease of hundreds of thousands of their countrymen. After losing a presidential election but declaring victory, Mugabe et al entered into a power-sharing standoff with actual winner Morgan Tsvangirai. a cholera outbreak in Zimbabwe, which has killed nearly 300 people, has created a new sense of urgency. A "group of Elders," including former President Jimmy Carter, former United Nations Secretary General Kofi Annan, and Graca Machel, wife of Nelson Mandela, has been trying to get into Zimbabwe with the purpose of measuring the breadth of the impending crisis for international aid agencies. Such a measurement could be an important first-step in helping the world community address the crisis in a targeted, successful way. But the Mugabe government, still in control, has denied visas to these three, known as the "Elders." It seems that the Mugabe government is willing, like despots throughout history, to preside over the unnecessary suffering and death of their countrymen so long as they continue to avoid the privilege of presiding. It's a tragedy. To learn more about Zimbabwe, go here. My mentor in the faith, Martha Schneider, used to advise me when I was confused or perplexed by something: "It's not something you can't pray about." Please pray for the relief of the Zimbabwean people and for the peaceful resignation of the Mugabe government. 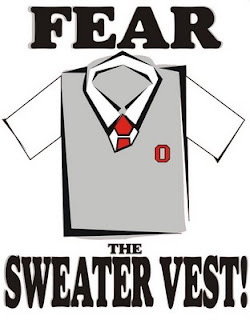 You don't have to be an Ohio State or Michigan fan to know that the rivalry between these two schools is huge. In Columbus, coaches with otherwise fantastic records have lost their jobs for failing to beat Michigan. Even in a year that has seen Michigan amass only three wins before the big game, it's an important game...and not just because Ohio State needs a win to ensure at least a share of the Big Ten title. The nature of this rivalry and the passions of the two schools are such that future renditions of the Ohio State-Michigan game will, as has so often been true in the past, have national championship implications. But even without those this year, both teams will try to show up with their A-games tomorrow. I'm looking forward to it. So, Where Exactly is Yemen? We read or hear the names of a plethora of countries every day. But I have to confess that as closely as I try to follow world news and foreign affairs, I can't always identify the locations of some countries. In this era of globalization and of the projection of US power and influence, it seems sort of important for we Americans to be more aware of the world around us. After all, people in Yemen, Bahrain, and other places can't avoid us or the influence of our culture. Today, the Middle East Strategy at Harvard blog linked to several geography quiz sites. They can be a little discouraging, but educational and fun. Geography-Maps-Games.com has all sorts of quizzes, testing both national and international geographic knowledge. Rethinking Schools Online has a map of north Africa and the Middle East to which you have to drag the country names. This is how the Daily Scroll headlined its link to a piece on this site earlier this week. In Beanie's freshman year, I wondered if he would make it as a Big 10 running back. He seemed to give way to the pounding backs must face in the league. (Of course, in my "prime," I couldn't have made it through the first team workout!) But he has become a fierce competitor, willing himself to push through incredible hits. The guy's low center of gravity and seemingly unstoppable leg drives cause him to make something out of runs that, with ordinary backs, would be dead at the lines of scrimmage. How Will You Invest Your Life? The parable that Jesus tells in our Gospel lesson this morning is likely one that you’ve heard many times. A master, preparing to go away on a long journey, gives whopping sums of money to three of his slaves, in lots of what were called talents. To one slave, he gives five talents; to another, two; and to a third slave, he gives one talent. Now, there’s no reason for us to feel any pity for the third servant. One talent amounted to between 75 and 96 pounds of silver and equaled what one day laborer would have received for about twenty years of work! So, the master is generous to all three slaves. He gives them their money, tells them he’s going away, and leaves. Later, the master returns and asks the slaves to tell him what they’ve done with the money he gave them. The first two report that they’ve found ways to double the master’s gifts. The master is so pleased that he invites the two to party down with him and he gives them greater responsibility. The third slave, probably confident that he’s done the right thing, explains that for fear of losing anything the master gave him, he had buried his one talent and now was bringing it back. The master isn’t pleased at all. “How wicked and lazy can you be?” he tells the third slave. “At the very least, you could have opened a savings account and gotten a little interest.” Then he orders that the one talent be taken from that slave and given to the first guy. And the third servant is sent away. There are three things I want to say about this story this morning. First: It’s important to understand that the master in Jesus’ story didn’t simply entrust this money to the slaves, but gave it to them. That doesn't come through very well in our translation. The word describing the master's action in the original Greek of the New Testament is paradidomi, which means to give over or hand over. The talents given to the three slaves was their money to use, to invest, to disburse, or to squander. The choices about what to do with those gifts were theirs to make. My first car was a 1963 white Dodge 330. I called it The Tank. I bought it...for a dollar from my grandfather. He gave the dollar back to me after we’d had the title work notarized. In other words, it was really a gift. And it was a pretty valuable gift, too, because my grandfather, just like my other grandfather, and just like my father, was a mechanic. (Those genes skipped over me!) When he gave that car to me, it was in top condition. How do you think I responded to his gift? I ran it into the ground! Now, here’s the point: Our lives, minds, and bodies are all gifts from our master, the God we know through Jesus Christ. So too, is the new and eternal life that goes to all with faith in Christ. So too, are the basic gifts we all enjoy as members of Christ’s Church: God’s Word, the communion of Saints, Holy Baptism, Holy Communion. On top of that, God gives to everyone of us skills, abilities, and spiritual gifts. God gives all of these things to you and me to be used. Not hoarded. Not forgotten. Not denied. But used. All of God's gifts demand a response of gratitude from believers in Jesus Christ. The way I treated the car my grandfather gave me didn’t display gratitude to him. I pray that the way I live my life displays gratitude to God for all His gifts to me. So point #1: God’s gifts deserve our gratitude. Point #2: The master in Jesus’ story gives no specific instructions on how his gifts are to be used by the slaves. He just gives them and leaves. That was so maddening to the third slave that he was left paralyzed and did nothing. You and I, as followers of Jesus, live in what can be called the in-between times. We’re in-between Jesus’ resurrection and His ascension into heaven, on the one hand, and His return, which will happen some day, on the other. Jesus has given some general directives to us on how to occupy ourselves during this in-between time. They’re called the Great Commandment and the Great Commission. Incorporated in two passages in Matthew’s Gospel, they can be summarized in five points: We’re to worship God with our entire lives; live in fellowship with Christ’s Church; open ourselves to God’s Spirit, so that we grow to become more like Christ; serve others in Jesus’ Name; and tell the world about the free new life God offers to all with faith in Jesus. But Jesus never tells us exactly how to do those things. Like the slaves in His story, we must decide for ourselves how to live in this in-between time, how to take the gifts God grants us and live faithful, useful lives. We must do that as individuals and as a church family, each seeking God’s glory and guidance above all else. Point #3: Like the slaves, we’re to do something with God’s gifts to us. The Christian life isn’t a passive life. Confident of our place with God for all eternity, we’re called to jump into life: serving others, sharing Christ with them, being advocates for justice, and acting as servants to the neglected and the despised. A number of years ago, Guideposts’ annual book of daily devotions had a piece written by a young man majoring in business at the University of Tennessee who apparently had a talent for investing in the stock market. By the time he’d reached the end of his junior year in college, he'd become successful at it and looked down his nose a bit at his parents for failing to make the most of their money. At home for a break, he made a few comments about this to his folks and how he believed they could do better with their investments. Next week will bring us to our Consecration Sunday. You’ll be asked to make an estimate of your giving for 2009. Last week, our own Bryan Starner suggested that you prayerfully consider increasing your giving by a “stairstep.” It will be great if you do that. But if, in consideration of all of God’s gifts to us, our financial giving is the only thing that increases, Consecration Sunday will be a failure. Even in tough economic times like these, it’s easier to write a check than it is to teach a class, volunteer for a ministry, tell a skeptical friend about Jesus, or visit a sick person. What sorts of risks may God be calling you and me to take today? Methodist pastor Douglas Mullins tells the true story of Belinda, a member of one of the churches he served. Belinda had become the single parent of a five year old son when her husband left her after she’d had breast cancer. He left when he realized that she would be disfigured by the surgery she’d undergone. None of us has anything that God needs. Everything we have comes from God anyway, just as the slaves in Jesus’ parable got everything from their master. But if you and I are going to faithfully respond to God’s call on our lives, if we’re going to express our gratitude to God for all His gifts, if we’re going to find our own unique ways of responding to God’s gifts, and if we’re going make investments of eternal significance, we need, like the first two servants in Jesus’ parable, to take risks. We need to take all the blessings God has given to us—including our time and talents and our passions—and invest them in loving God, loving neighbor, serving others, and making disciples. We need to move from being Christian spectators to active Christian disciples. It’s only when we strive to use all our gifts in response to God’s love in Christ that we really start to live! When pour our lives into living for God's purposes--what Methodist theologian Leonard Sweet calls "cashing our last check"--we find as those first two servants did, that God’s presence, provisions, and promises fill our lives. Think that The Ohio State University is just about football Saturdays? The largest university campus in the world is a place where the Arts and Sciences flourish. Its professors and student body are among the tops in the world. Read here about a new and unique relationship with the Royal Shakespeare Company just established by the university. One of my favorite classes during my years as a student at Ohio State was Introduction to Shakespeare. While I had read a lot of his plays while in junior and senior high, the course took my appreciation of "the Bard" to a whole new level. This new relationship will give OSU students unprecedented opportunities to learn and apply the works of Shakespeare in their lives. from a few weeks ago. Meanwhile, his uncle links to a piece from mlb.com indicating that the Reds are sort of sitting back during this off-season.